More than a decade ago, in the middle of the native plant movement in Texas, garden historian Pam Puryear of Navasota showed me a spontaneous hybrid columbine that had appeared in her garden. A surprise child, if you will. It seems that Puryear's cousin, Emily Lott, had been working on an advanced degree at Sul Ross Sate University studying native Texas columbine species. One day, she appeared at Pam's house with a representative sampling of each Aquilegia species in the state. Being an adventuresome gardener, Pam planted them in her border. There they were. New residents in the neighborhood. Aquilegia chrysantha, A. chrysantha chaplinei, A. chrysantha longissima, A. chrysantha hinkleyana, and A. canadensis. They didn't even speak English, Latin only. For anyone who lives in a multicultural neighborhood, this may not seem like much of a feat. But to a lifelong gardener it was a horticultural and botanical event-history in the making. You see columbines aren't supposed to grow in Texas. Furthermore, these columbines had never even met before. Each grew isolated in West Texas along rocky streams protected by a fortress of rugged Texas mountains. There just wasn't any way or occasion for them to fraternize. That is, until Pam Puryear provided them that chance. And as chance would have it, A. chrysantha hinkleyana (Hinkley's columbine) and A. canadensis (Eastern columbine) produced a small family of hybrid offspring. Apparently columbines have a history of being "friendly" with their kin. Although certainly not spectacular, the little patch of hybrids that emerged between the parent plants was intermediate in color between the two. Hinkley's columbine is noted for its larger, erect golden flowers. As the showiest of our native columbines, it was named a Texas Superstar by Texas A&M University in 1993 as 'Texas Gold' columbine. Eastern columbine, on the other hand, is noted for its diminutive, hanging flowers in a combination of red and yellow. Though quite attractive to wildflower enthusiasts, it has never proven popular in the local ornamental trade. Remember, "everything's bigger in Texas." The significance of these volunteer hybrids was that they combined the more colorful flowers of the Eastern columbine with the larger flowers of Hinkley's columbine. This wouldn't have thrilled any plant breeder from Europe or the North where large, showy columbines are readily available in an exciting range of colors. But in Texas, where all those large, showy columbines die in summer from acute heat stroke, this was a major breakthrough. Unfortunately, most of the flowers were pale yellow with traces of red on them. The petals were narrow and weren't as showy as the Hinckley's columbine parent plant, either. But at least there was hope. I collected seeds and brought them to San Antonio where, aided by rebel plant breeder Dr. Jerry Parsons of the Texas Agricultural Extension Service, we produced a second-generation crop of seedlings. I figured if Jerry could do the same with Texas bluebonnets (which he had), why not other Texas wildflowers? And with the help of Parsons, Clyde and Bernice Ikins of Bandera, and Jackie Emanis Grant of Arcadia (my mom), we practiced the old breeding technique of "bulking and roguing." Any inferior flowering forms were pulled up and discarded while the showier, flowered types were left to cross again. Due to a lack of red pigmentation, I infused a little more Eastern columbine blood into the mix to darken the flowers. And, in Luther Burbank fashion, after about 10 years a new, stable columbine was born. How about a big Texas welcome for the Blazing Stars columbine (Aquilegia x puryearana 'Bernice Ikins'). Like 'Texas Gold' columbine, Blazing Stars is a cool-season perennial. It makes vegetative growth in fall, winter and spring before going dormant in summer. The beautiful red and gold flowers are produced in early spring. Texas columbines grow best under deciduous shade trees in well-drained soil with regular summer irrigation. Don't forget they grow next to streams in the wild. If allowed to set seed and reproduce, Blazing Stars will reseed true to type. That's assuming it's isolated from other columbines. Otherwise, be prepared to welcome more new family members to your garden! Editors Notes: I first discovered this new hybrid Columbine in the garden of noted Texas garden historian, Pam Puryear, of Navasota, Texas. Now, after ten years of development, and help from Bernice Ikins, and Dr. Jerry Parsons, it's finally ready for the garden. Blazing Stars Columbine is a hybrid between two of our native Texas Columbines, Aquilegia canadensis from Central Texas, and Aquilegia chrysantha hinckleyana, from Big Bend. Our native species and varieties are the only columbines tough enough to survive our hot, searing summers. This new hybrid combines the flower color of the diminutive Eastern Columbine with the larger flower size of Hinckley's Columbine. Though not as showy as commercial northern cultivars, it greatly expands the color range in columbines for the hot, humid South. Blazing Stars columbine is a cool season perennial that thrives in well drained soils under deciduous shade. Owing to it native roots along streams, it requires regular irrigation during the summer to avoid dormancy. 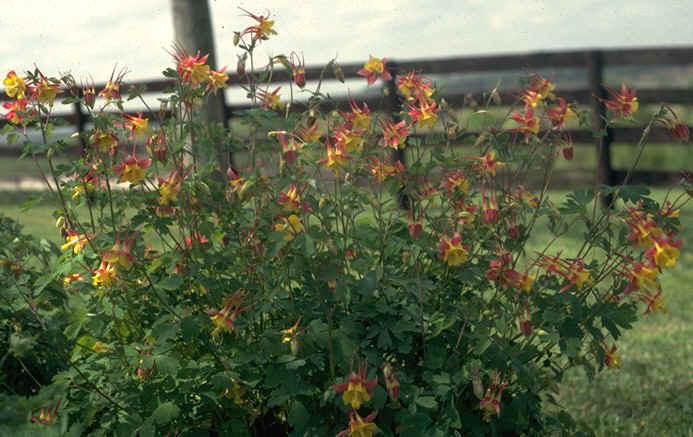 If allowed to set seed, and other types of columbines aren't in the vicinity, it will breed fairly true to type, with some variation in the amount of red and gold, as well as flower shape. For best growth, shear the plants in the fall and apply a light application of a lawn fertilizer such as 15-5-10.